I look forward to the Canadian National Exhibition in Toronto every year and have been a social media ambassador for this iconic event in the past (this is what launched me into social media in 2010). I just downloaded a free child admission ticket from their webpage, they are available to print or load to a smart phone until August 18, 2016. 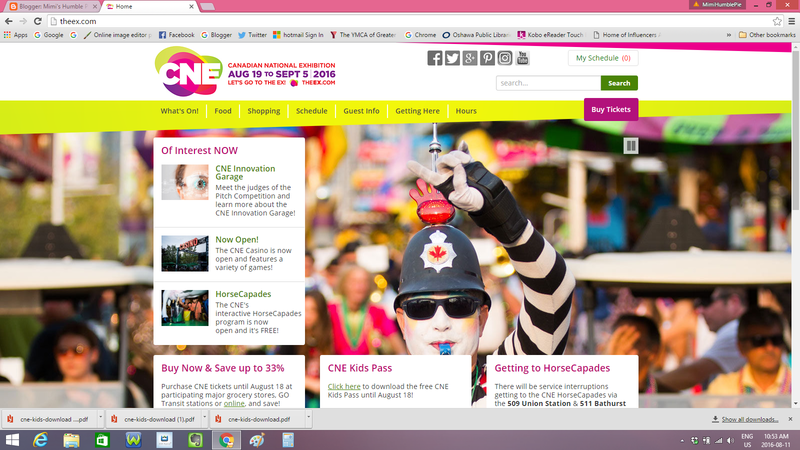 The CNE is generous enough to allow you to add up to ten child admission tickets to your "purchase". There was no purchase necessary and they did not ask for credit card details, only a first and last name of the the parent/guardian and email address. This is also a good time to purchase your Adult Passes, since they are 33% cheaper now than when they open on August 19, 2016. Another budget friendly option is the $6 after 5 pm admission (please visit the CNE site for ticket sale information and terms). Disclaimer: This is not a sponsored post, though I did win a free 2016 Adult Admission pass from my social media interaction with the CNE.